These are beautifull days! Whenever there are celebrations the beautifull editions appear all around. I thought it was time to write an article on all the Deluxe editions published by Harper Collins. First i will describe them a little and then go deeper inside the whole 50th Anniversary event. What is it all about, what is new in these editions? Why did these changes appear? Why all these beautifull editions? The history of the writing of The Lord of the Rings is told in detail by Christopher Tolkien in four volumes of his History of Middle-earth series: The Return of the Shadow, The Treason of Isengard, The War of the Ring and Sauron Defeated. A brief summary of this history is contained in J.R.R. Tolkien: A Descriptive Bibliography by Wayne G. Hammond, with the assistance of Douglas A. Anderson. Here, however, it will suffice to say that the work was often delayed by Tolkien's duties at Oxford, by the Second World War, by ill health, by bouts of failed inspiration, and by the distraction of other writings. Tolkien did not finish writing it until 1949. As Tolkien remarked in the foreword to its second edition, The Lord of the Rings 'grew in the telling' until it was not simply another story about hobbits, but part of the larger mythology that was in his heart. He came to feel that The Lord of the Rings was the 'continuation and completion' of The Silmarillion, and that the two works should be published 'in conjunction or connexion'. Allen & Unwin, however, could not afford to publish both works as the author wished, nor could Collins, with whom Tolkien dealt in 1949-52. The works were enormous, and production costs were rising, but with the arrival of Rayner Unwin at his father's firm Tolkien at last received encouraging word on his 'great (though not flawless) work', and it was eventually agreed that Allen & Unwin would publish The Lord of the Rings in three volumes. After a long and difficult period of production, The Fellowship of the Ring was published on 21st July 1954. The Two Towers followed this on 11th November, and The Return of the King finally appeared on 20th October 1955, it having taken almost a year to bring the appendices, which Tolkien considered essential to the work, to a satisfactory conclusion. What is different in the 50th editions? To commemorate the 50th anniversary of the first publication of The Lord of the Rings, HarperCollins is proud to be offering for sale a special, de luxe edition of the complete text, which has been fully reset and includes the Appendices and an updated index. With access to Professor Tolkien's own manuscripts and annotated "check" copies, and with the full co-operation of his son and literary executor, Christopher, Tolkien scholars Wayne G. Hammond & Christina Scull thoroughly reviewed the text, with the assistance of Douglas A. Anderson, and have restored almost 400 corrections, some of which date back to the first edition. This special edition also features for the very first time the three pages from the Book of Mazarbul, facsimile illustrations painstakingly created by Tolkien and intended for inclusion in the famous 'Bridge of Khazad-dûm' chapter. Also appearing for the first time are two previously unpublished Hobbit family trees and the original red and black maps drawn by Christopher Tolkien, two of which appear as fold-out sheets. The text has been printed on superior, acid-free paper and features Tolkien's own Ring inscription in red ink, together with a red silk ribbon marker. 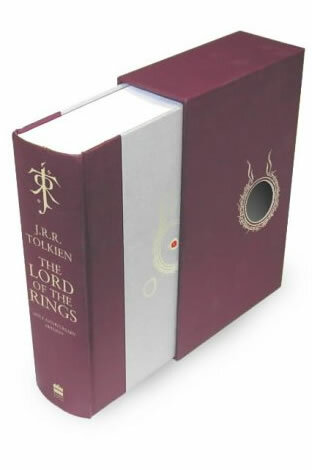 The book is quarter-bound in red with grey board that has stamped into it in red and gold foil Tolkien's Ring and Eye of Sauron symbol. The book is housed in a matching slipcase which features the Ring-inscription in gold foil that surrounds a circular hand-cut hole, through which can be seen the Eye of Sauron. 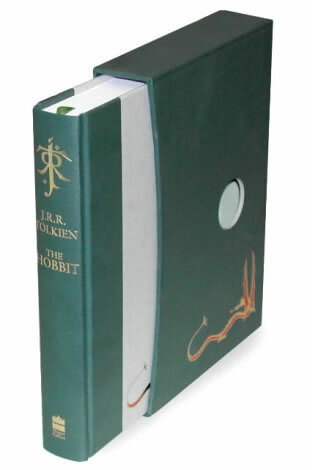 To complement this we are also publishing a de luxe edition of The Hobbit, the enchanting prelude to The Lord of the Rings which has sold almost 100 million copies in nearly 40 languages around the world. This new edition features the definitive setting of the text, overseen by Douglas A. Anderson with the full co-operation of Christopher Tolkien, who also provides a lengthy introduction about the history of The Hobbit. It features all of Tolkien's illustrations in colour. Additionally, and unique to this edition, is included Tolkien's illustration of "The Three Trolls are turned to Stone", which appears in The Hobbit for the first time. The author's illustration of Mirkwood appears as the front endpaper and his Map of Wilderland appears in blue and black, variations that the author favoured but which were never included until now. Lastly, Thror's Map is included for the very first time as a fold-out sheet, with the magic runes printed on the reverse so that they appear to magically show through, again as the author originally intended. Like the de luxe edition of The Lord of the Rings, the book is printed on superior paper with a silk ribbon marker. It is quarter-bound in green with grey board, on which is foiled the secret Dwarf runes and in red and gold the great dragon, Smaug. The book is housed in a matching slipcase which again features Smaug in two-colour foiling and there is a circular hand-cut hole through which can be seen the runes. These two de luxe editions are bound to prove popular with collectors and as gifts, and are sure to sell out soon. “Why all these beautifull editions”: This introductory text appears in the Tolkien Calendar 2005, and is adapted from J.R.R. Tolkien: A Descriptive Bibliography by Wayne G. Hammond, with the assistance of Douglas A. Anderson. “What is different in the 50th editions”: This text is a modified version of a text that appears the website Tolkien.co.uk and the copyright is of Harper Collins.